Copying Machine is for people who have a scanner and a printer attached to their PC. The idea is very simple; scan a document with a scanner and print the acquired image on the printer. Et voila: a real copy of your document. Copying Machine works just like any real copying machine, but has some additional capabilities. For example you can save the images to disc so you can make copies of them in the future without having to scan them again. You can make a selection on a page in order to zoom in on a particular part. Another feature is that you can align an image so it is perfectly centered when printed. And with the latest version you can even draw on the acquired documents to hide some information for example. Copying Machine is shareware, and obtaining a personal registration key costs $5. More scan settings available in the copy pane; brightness, contrast en document feeder. Bug fixes in the brightness and contrast settings. Black/White, Grayscale and Color copies. Multiple languages, Dutch, English and German. 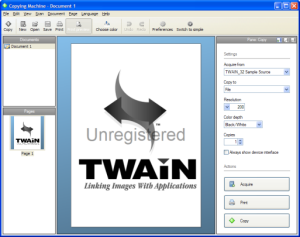 Scanning with TWAIN and WIA-compatible devices. Support for TIFF (compressed and uncompressed), JPEG, PCX, BMP and PNG file format. Export to e-mail and PDF. Optical Character Recognition on selections. Basic function for editing pages. 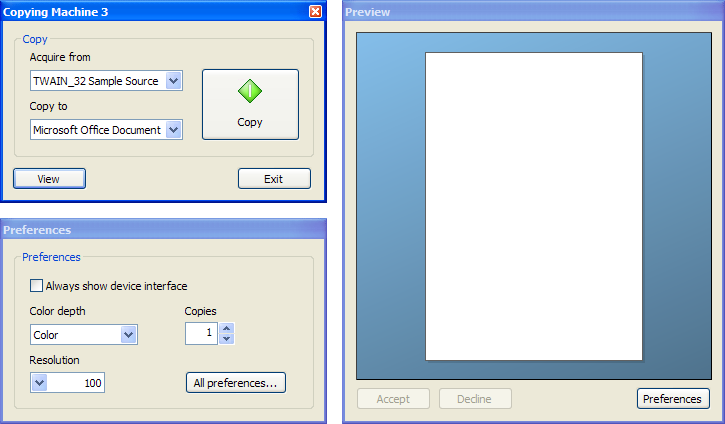 See the help section for a complete overview of the capabilities of Copying Machine. 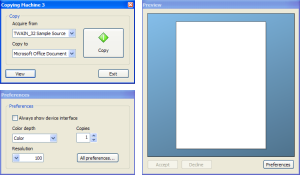 Copying Machine is shareware, that means that you can try and evaluate it for free. The version you download is a full version with all functionalities in tact. It will only show a couple of reminder screens. When you like it and you want to support the development of Copying Machine, please register. The price for registration is only $5. If you use Windows 10 you can install Copying Machine 3 from the Microsoft Store. If you use this version you don't have to register via PayPal. You can pay directly via the Microsoft Store. There is also free trial version available. You can register Copying by ordering it with PayPal. Press on the button below. When the registration process is completed at PayPal or ShareIt, I will receive an e-mail notification from them. When I get this notification I will send you as soon as possible your personal registration code to your e-mail address. If you have any questions, you can always contact me by e-mail at webmaster@meusesoft.com. "I just downloaded your 'copying machine' and now I can use my scanner that I've had for a couple of years! It has been a shelf (nice flat surface) basically since I got it." "I just finished trying out Copying Machine and would like to thank you for this well designed and thought out program."